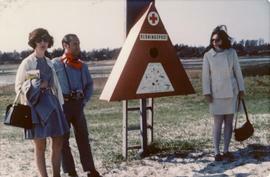 Photograph depicts Elaine, and Lory & Warren Epstein in front of a lifeguard post. Photograph depicts Elaine Fromson at the beach. Photograph depicts Elaine at the beach.